Innovative solution for intelligent hand soldering With the i-con ERSA has developed a soldering station that is able to compile with the increased working temperatures and the decreasing size of the process window of lead free soldering processes. 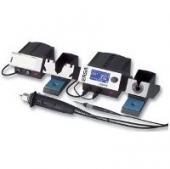 The extremely small, light, ergonomic and powerful soldering iron i-tool contributes significantly to improved quality and to a tremendous decrease of operating costs. The station consists of an electronic station (0IC203A) with power cord (3K120KR053075), a soldering iron i-tool (0100CDJ) with an ERSADUR longlife soldering tip (0102CDLF16) and a holder (0A50), Desoldering iron x-Tool (0720ENJ) with tip (0722EN1223), holder for x-Tool (0A44) and vacuum station for X-Tool (0CU103A).